As voters head to the polls Tuesday, opponents of Proposition 23, the California ballot measure that would suspend the state’s global warming law, are hoping the San Francisco Giants’ win over the Texas Rangers augurs well for the outcome of the election. 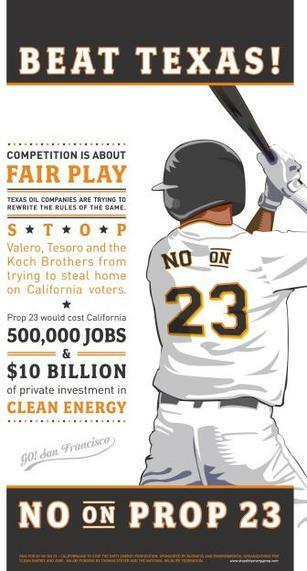 The latest polls show Prop 23, which is backed by Texas oil companies and the petrochemical industry, heading to defeat, though a large number of voters remained undecided. The lack of enthusiasm for Prop 23 could be seen in the final fundraising disclosures filed with the California Secretary of State’s office. As the election ends, the No on 23 forces have raised $31.3 million to the Yes effort’s $10.7 million. In the final week of the campaign, the Yes campaign raised only $6,000, including a $5,000 donation from NACS, previously known as the National Association of Convenience Stores. Prop 23 opponents continued to rake in the cash right up to Election Day, with more than $766,000 filling coffers in the final week of the campaign. Among the big contributors in the last week was the California Democratic Party, which gave $224,534. Sempra Energy, which owns one of the state’s largest utilities, San Diego Gas & Electric, made another $25,000 contribution. That fundraising prowess is in part a reflection of the broad-based coalition the No on 23 campaign put together. Among those making common cause to preserve California’s climate change law are national environmental groups, Silicon Valley venture capitalists and tech giants, hedge fund managers, old economy businesses, and environmental justice activists. The global warming law, known as AB 32, requires California to cut greenhouse gas emissions to 1990 levels by 2020. Prop 23 would suspend the law until the state unemployment rate — currently 12.4 percent — falls to 5.5 percent for four consecutive quarters, something that has happened only three times in the past four decades.